This book first came onto my radar about a year ago and it seems to have taken a life on its own. As far as I know, there was not organized publicity push, just word of mouth. Given that, the fact that this book, and the other books in he Neapolitan Novels series, have become so popular is quite the endorsement. I was nervous when I picked this up. Given the hype, I was worried that it wouldn't live up to everything I had read about it. Fortunately, I had nothing to fear. While this book was somewhat different from what I expected, it was still a wonderful read. To be honest, I don't know what I was expecting--perhaps an updated version of A Room with a View/?--which isn't fair because really nothing would suggest that other than this book is also set in Italy, albeit Naples instead of Florence. In fact, it was the setting that first drew me into this story. I've been to Naples before--for about 30 minutes. When I was 14 years old and on a tour of Europe, we were in Naples just long enough to get on a boat for Capri. Our tour guide told us that Naples was a very, very dangerous place and not to even consider leaving the spot where we were waiting for our boat. Because of those 30 minutes, I've had this fear/fascination with Naples--what did I miss? Luckily, reading this book is almost like going to Naples. 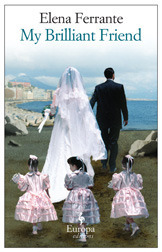 Ferrante recreates the city in a way only a native can. I could almost feel the cobblestone under my feet as Elena and Lila walked their neighborhood. After reading this, I can't say that the tour guide's words have gone from my memory--there is definitely an element of, if not danger, violence in this world. I would say it is somewhat in the vein of what one would see in a Mafia movie, but not nearly as organized. Instead, it is the result of overflowing passions among a very passionate people. This book begins with an index of characters, which is essential (and is also why I would recommend reading this book in print and not electronically--you'll want to be able to flip back to this!). Even the secondary characters are carefully drawn, but the names are just foreign enough--and some characters go by multiple names--that any reader will put the index to good use. At its heart, this book is about the friendship between Elena, the narrator, and her fierce friend, Lila and it covers their childhood and adolescent years. I honestly do not believe a more realistic depiction of female friendship has been written. These two characters love each other deeply--but also envy each other, use each other, and sabotage each other. The choice to have Elena as the narrator is a smart one. She feels that she is always on the subordinate end of the relationship, although many times that is of her own doing. Also, since we only see her side of things, Lila remains a delicious enigma. My only complaint, if you can call it that, of this book is in some of the language. I don't feel that it is a fault--I have a feeling that this is just how Italian works and the narrator tried to stay as true to the original writing as possible--but there are times when the sentences are just too busy. The language is beautiful, but there are so many clauses in the sentences that I sometimes had to read them more than once to make sure I understood them. That, however, is only a minor quibble. All in all, this was a fantastic book and one I would recommend to anyone--and I can't wait to continue in the series!